Four (4) 3oz. Bottles. 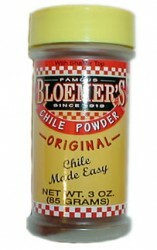 Also available in a combo pack with Bloemers Original Chile Base here. Allow 48 hours (Monday through Friday) + shipping time for your order to arrive. Since 1919, we at Bloemer Food Sales Co. have offered a variety of delicious food products ranging from our famous Chile Base to our new Taco Seasoning. Enjoy touring our site. We look forward to hearing from you. © Bloemer Food Sales Co., Inc.